Once they only lived on the Iberian paeninsula and Morocco. Romans brought Once they only lived on the Iberian paeninsula and Morocco. Romans brought them to Italy, and soon the fertile animals spread throughout Europe. Except for the British Isles. There, they weren’t introduced until late twelfth century, probably by Norman nobles. Maybe one of them brought a pair of rabbits for his love, and this escaped (the pair of rabbits, not the love). Before you knew, all of Brittain was suffused with fluffy rabbits (like in the Teletubbies). On the European mainland rabbit hunting was a hobby for ladies, boar and stag hunting were considered too dangerous. The rabbits were kept on enclosed grounds. Rabbits were also fattened in hutches. 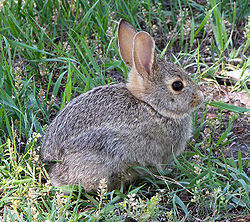 In Australia rabbits weren’t introduced until 1859, and then they formed a plague, because they had no natural enemies. In cookbooks rabbits have a special place: recipes for wild rabbits can be found at the section with recipes for small game, but for recipes for fattened rabbits you’ll have to look under poultry. Indeed, the meat of wild rabbits looks and tastes different from that of tame ones. Recipe: Turk’s head. These are dried grapes. There are several kinds of raisins, depending on the kind of grape that was used. Sultana’s are NOT raisins a special brand, but the dried berries from the sulatana grape. Currants are original the dried grapes of a grape variety with small berries that was grown in Corinth (Greece). There are more varieties used for raisins, like the Seedless Thompson. Recipes: Strawberry pudding, Marrow Pasties, Stuffed quinces, Genestada, Stockfish with apple and peas. Indigenous to Europe and Asia, as are other members of the Ribes-family, blackcurrants and gooseberries, but they are ‘late-bloomers’ with regard to culinary practise. According to Alan Davidson (The Oxford Companion to Food) Redcurrants (Ribes rubrum) are first mentioned in an unspecified German manuscript from the beginning of the fifteenth century, and are cultivated, especially in the Netherlands and Danmark, since early sixteenth century. Cultivation of blackberries (Ribes nigrum) is even more recent, in the seventeenth century. 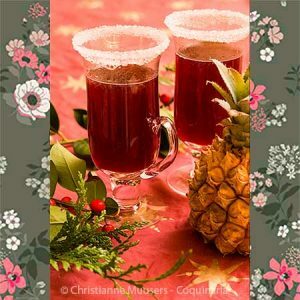 The French drink Crême de cassis (used in Kir and Kir Royal) is made with blackberries, as is the soft drink Cassis. Whiteberries are spontaneous varations of redcurrants, sweeter in taste. They are least in use in the kitchen. Gooseberries are cultivated since early thirteenth century. There are several medieval recipes with gooseberries, but hardly any with currants. 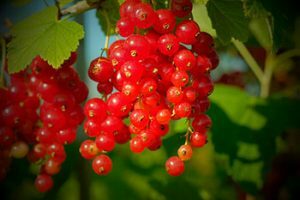 It seems however that currants were used in medicine, especially in treatment of skin diseases (according to this source the eleventh-century Persian scientist Avicenna already mentions them in this capacity). In Dutch currants have several names. Similar to English (rode, witte and zwarte) bessen, but also aalbessen and Sint-Jansbessen. They are called Sint-Jansbessen or Saint-John’s Berry (German: Johannisbeeren) because the berries are ripe around the Celebration of Saint John the Baptist (June 24), aalbessen or aleberies because the juice was used to make drinks with. The English word ale is related to the obsolete Dutch word aal, so aalbessen could be translated into drinkberries or simply aleberries. What kind of drinks can you make with berries? Redcurrant wine (once very populair in the Netherlands amongst women because of its sweet taste), blackcurrant gin, Crême de cassis, cassis soft drinks, to name a few (cassis is French for blackcurrants). Recipe: Redcurrant sauce for roast chicken. The renet family is large, there are many varieties. According to the French Wikipedia the oldest mention a Reinette dates from 1540. There are two theories about the meaning of the name. Either it simply means ‘queen of apples’ (from French reine, ‘queen’), or the name is derived from ranette, a diminutive of rana [de grenouille], the spots on the belly of a frog. Indeed, renet apples have a speckled skin. Recipe: Divine wine. Rice is associated primarily with Asian cuisine. The grain is indeed indigenous to Asia, but was introduced in Europe as early as 327 BC by Alexander the Great. However, it remained a curiosity for a long time. Exactly one recipe with rice can be found in the Roman cookbook De Re Coquinaria, pounded as thickener for a sauce for meat balls. It wasn’t until the conquest of the Iberic paeninsula by the Moors in 711 AD that rice was introduced as a crop. It would take another seven centuries before rice was grown in Italy, in the Po Valley. In Spain as well as Italy both short and middle long grain rice was grown. Recipes: Roman sourdough bread, Blancmange with crayfish. This is simply ground rice. Rice flour is used a lot in processed baby food, and in Asian cuisines it is used to make noodles. There are two kinds of rice flour, from longgrain rice and from glutinous rice which is typically used in Asian sweets and desserts. Rice is gluten-free, so rice flour is also free from gluten. Recipe: Genestada. Literally this means re-cooked, or twice cooked. Sometimes it is compared to cottage cheese, but the production is very different. To separate the curd (from which cheese is made) from the whey, milk is heated. Whey, normally a leftover product (that is loved by pigs, by the way, see picture on my cheese page), is reheated to make ricotta. Rennet is added to the whey, or another coagulant. The result is a moist, crumbly cheese. Recipe: Tortellini in brodo. The leaves and seeds from Eruca sativa have been used as early as Antiquity. The seeds were considered an aphrodisiac. Rocket is still popular in Italy where it is called arugula or ruchetta. It is used in salads, but also in some dishes with pasta or rice, and as garnish for pizza. Recipe: Dutch garden salad. 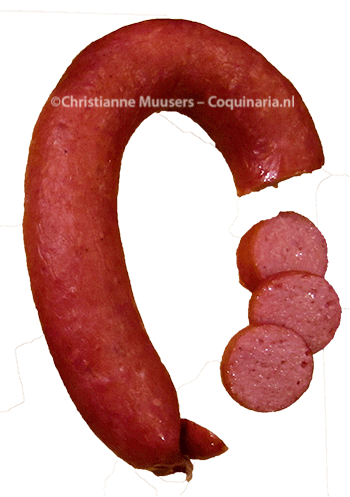 Literally rookworst means ‘smoked sausage’, but not just any smoked sausage is a Dutch rookworst. It can be made of 100% pork, but there’s also rookworst from beef (which I find less tasty). Pure pork rookworst is made from one part lean pork and two parts pork fat (from belly, back and jaw), with salt, very little sugar and white pepper. Then the meat is encased in natural gut, and the sausages are tied with their ends together (see picture). After drying for twelve hours they are cold-smoked for 24 to 36 hours. At least, that is how they used to be made. Today most rookworst is mass produced, the sausage encasing is artificial, as is the smoke taste, which comes from articial flavouring. Pity. Not that the Dutch people seem to care, they buy Unox rookworst en masse at the supermarkets, in stead of supporting the few butchers that still make their own rookworst. Recipes: Stamppot with potatoes and kale, Kale with chestnuts and groats. This is indeed water that is perfumed with rose petals. In the modern Western cuisine its use is obsolete (except in e.g. marzipan), but during the Middle Ages and Renaissance it was a popular condiment (as was orange blossom water). In the Middle-East and India rose water is still in use. Recipes: Almond paste, Panunto, Flowers in jelly for Valentine, Thin wafers with whipped cream, Italian pasta from the 16th century, Gooseberry omelette, Royal white tourt, Plum pie. 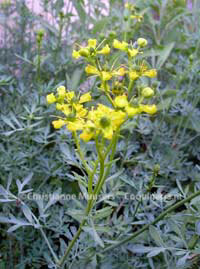 A small shrub (Ruta graveolens), indigenous to Southern Europe. The odiferous plant has a strong, bitter taste. The ancient Greeks and Romans loved rue, and it is still an ingredient in the Italian drink Grappa Ruta. In modern cuisine rue has mostly dissappeared, which is a pity. A few rue leaves in broth are very good. However, it is thought to be an anaphrodisiac (quenches lust), and pregnant women must be careful not to use too much of it, because it could also be abortive. But a leaf or two won’t do any harm. Rue plants can be found at garden centers. It is quite decorative, a semi-perennial with small yellow flowers that can be used to decorate any dish. Recipes: Medieval Arab pasties, Beef Stock, Roman broccoli, Mulahwaja, Lucanian sausages, Chestnut purée. This grain (Secale cereale) originates in Central Asia, and reached Europe with travelling nomads as a weed in crops of wheat and barley. Rye was not cultivated as a separate crop since about 400 BC, which was much later than the grains it had travelled with. Rye grows on on poor soil and in cold climates, and was planted especially in Northern and Central Europe. Rye is low in gluten, that is why it is often combined with wheat to makea lighter bread. Rye bread is typically leavened with sourdough. Bread baked with wholegrain rye meal is black (or dark grey). In exceptionally wet seasons rye can be contaminated with a parasitic fungus, Egrot (Claviceps purpurea). This fungus infests the grains and replaces them. It is very poisonous. If contaminated rye is harvested and used, it will cause hallucinations, aborted pregnancies, gangrene and even death. During the Middle Ages there were several outbreaks of ergotism, and it may have been a factor in the witch trials in Salem in 1692. 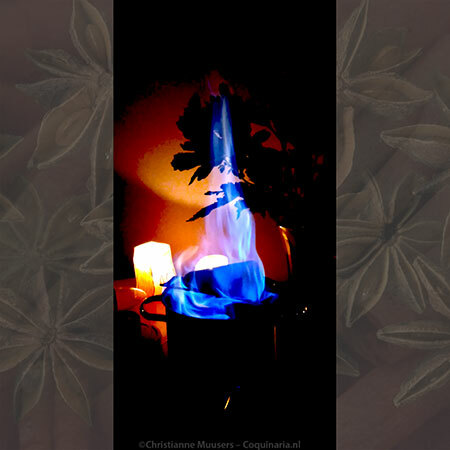 Ergotism is also known as Saint Anthony’s Fire. Recipe: Peperkoek (spice cake).